A championship wrestling match pits Koji Taguchi against Crush Volcano, the latter no match for Koji's signature move, the Torture Ring Strangler. Koji beams as he clutches the Champion Belt, only to have it snatched away by a mysterious new challenger in the ring--a giant squid! A giant squid, in fact, who not only evades Koji's key attack, but destroys him with a Northern Light Suplex! Koji's fiancee Miyako watches tearfully, though there's something about this Calamari Wrestler that seems familiar to her. Goofy, bizarre, yet surprisingly coherent, The Calamari Wrestler veils sharp social commentary with irreverent humor and corny romance. From the director who brought you EXECUTIVE KOALA here comes another gem, this time about wrestling seafood. If you find a man in arubbery squid costume endlessly amusing then this is your kind of film. 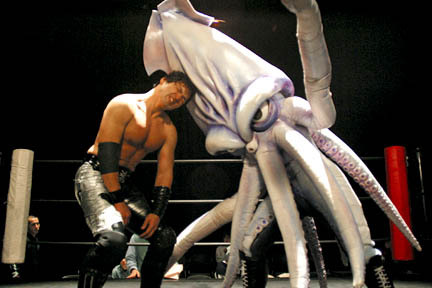 It's definitely mine. .
A man-sized squid takes on the Japanese wrestling world. Yep. When you hear the title and/or see the posters and promo pictures you immediately know not to take this movie seriously. You expect it to be a movie that will crack you up. Well it did crack me up. For the first few minutes that is. This movie gets old really quick and it becomes a bore fest. At times it gets really serious and the only thing really hilarious about this movie was the fact that the main character was a giant calamari. Once you stop laughing at that it's all downhill from there. When a comedy stops making you laugh you know your wasting your time. The title pretty much sums it up, but there's a surprising amount of heart under the tentacles.